Continuing on Geoff's last post about virtualized reality and future spontaneous model-making of the battlefield, I'm going to try and pick up where that one left off. More so, however, than using aerial photographs embossed with distance measurements to render 3D topographies of landscapes, the potential to combine that data with developments in autonomous target recognition (ATR) will soon make invasions the things of one-man device-in-hand video game-hero approaches to urban warfare. According to this brief in New Scientist, "avoid me" targets can be tagged to buildings using a thin sticky material, which "contains a small battery that powers a photo-diode tuned to sense light at wavelength of 1.55 micrometres, in the mid-infrared." This diode reflects an "avoid me" cue to pilots or unmanned aerial vehicles who scan buildings with lasers before attacking, therefore hoping to greatly reduce the potential for mistargets and casualties of friendly fire. The use of lasers is much more preferred over older systems of ATR which have relied upon radio and have become increasingly susceptible to improvised jamming capabilities. Such lasers are now even being used to identify breaches in natural gas leaks of pipelines as well, which harnesses a similar laser and crystal prism reflection technology. But even beyond that, a recent story in Wired talks about a soldier's potential to take full advantage of this new medium for a kind of "surveillance/command game space" and ATR technology in ways that sound like a single soldier in the field would be able to personally take on the Taliban, or an al Q bunker, or something. All he would need is some sort of palm pilot and a UAV (Unmanned Aerial Vehicle) hovering at his disposal. Once the soldier has gotten the up-to-minute 3D map of a concerned area (as discussed earlier), the soldier would be able to activate building sensors that have previously been mounted in the area to see through the buildings and identify the people hiding inside, before rendering their avatars in 3D displayed over the soldier's wrist band. Then, dispatching a swarm of robots from this same wrist band, they are deployed by the UAV waiting at his command. 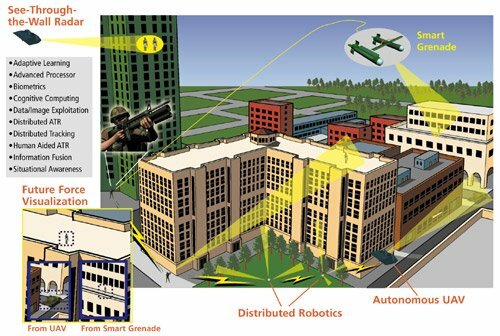 The surveillance swarm emerges from a non-lethal missile which penetrates through a window and then gives a more specific identification of the suspects inside the building, taking all sorts of video feeds with these tiny deposited cameras. Now, we have a complete interior 3D map of the building and all of the objects within it as some of the robots continue to seek-and-swarm every room for greater model making accuracy. 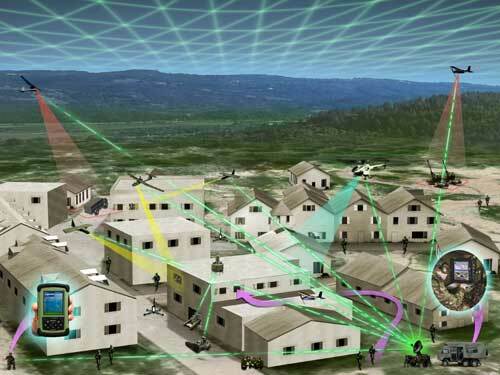 While Raytheon is allegedly working on this type of ATR using display visors and SOCOM-like augmented game interface, Northrop Grumman has come up with the HURT system (Heterogeneous Urban RSTA), which allows UAV's to shadow objects moving or otherwise as assigned to them, which "can also store captured images -- sort of like a battlefield TiVo -- for playback on demand by any user." All of this seemingly controlled by a simple handheld device, battle visor, or guerrilla wrist watch. I don't know if this means one day active duty forces will be fighting wars from their armchairs at home, with their warfare-gamepads in one hand and their newborns in the other, or if a whole new breed of soldiers will be standing in noisy arcades downtown to fight future wars abroad. But frightening as the fantastic game-ification prospects of warfare may be, I'd have to say, the Sony PSP ain't got nothin' on these gamepads, yet. But who knows, maybe it will be Sony and EA leading the next generation of defense contractors, as tomorrow's battlefield morphs into a chessboard-matrix of networked tribes vying for virtualized spaces and control.